First off, Merry Christmas! Today we wanted to bring a little piece of our Christmas morning to you! Straight from our table to yours, this cinnamon apple streusel bread is our contribution to the Christmas breakfast we will be enjoying at my mom’s house Christmas morning. Every year, my mom makes cinnamon rolls for the kiddos to enjoy, but they are not paleo friendly, and I probably turn green with envy while my nephews get all messy eating their gooey rolls. So this year I took measures into my own hands and made a little treat everyone could enjoy, but more importantly, something delicious Justin and I can eat, too. Honestly, good luck to everyone else because Justin and I could have eaten the entire loaf the day I made this bread for the first time, and we have been looking forward to devouring it again Christmas morning. 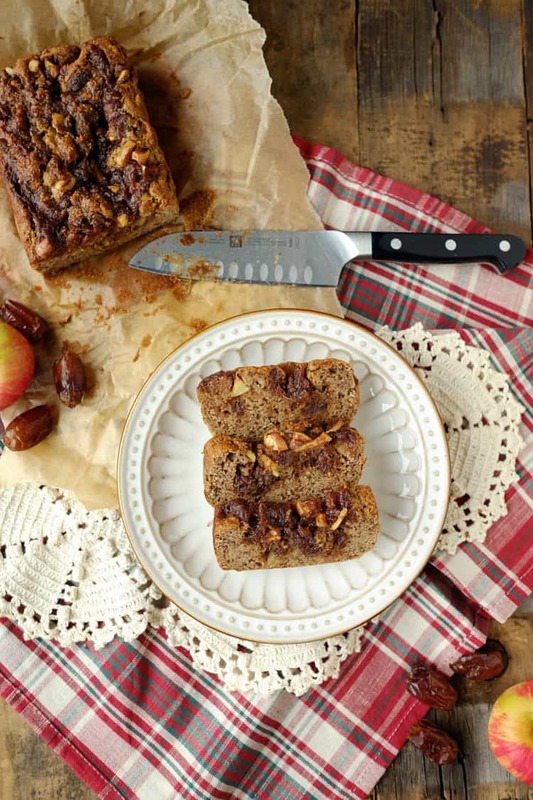 Our cinnamon apple streusel bread is decadent. 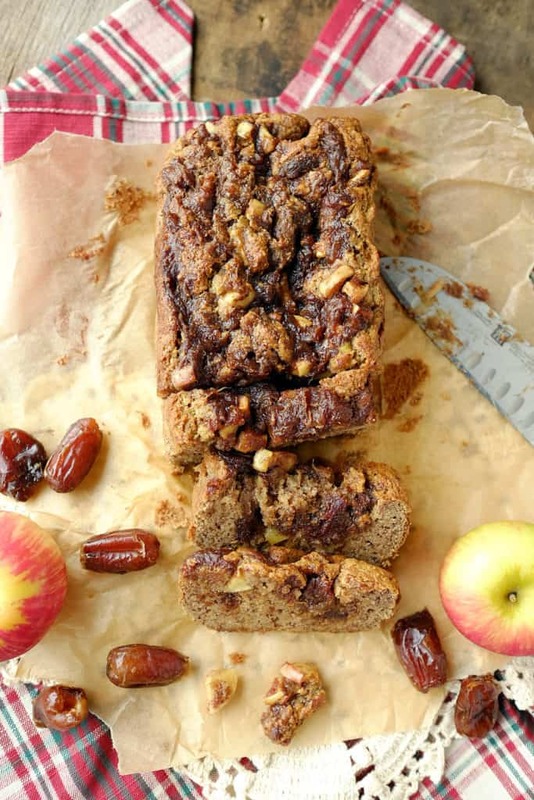 The bread is savory while the streusel topping is velvety with little chunks of apple, all wrapped up in a honey-cinnamon date paste. For real, roll your sleeves up and get ready to eat your face off. Don’t you want to just dive right in?! 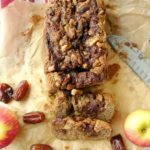 The cinnamon with the date paste in the streusel topping gives our cinnamon apple streusel bread a flavor similar to cinnamon rolls, and the apple chunks really take it to the next level, adding an apple pie like component. Consider yourself warned. You won’t be able to stop at just one slice. We will be cozying up and enjoying this (and maybe a peppermint mocha or two) and each other’s company tomorrow morning. We hope will all be doing the same! Happy holidays! We can’t wait to see what the new year has in store! Cheers! 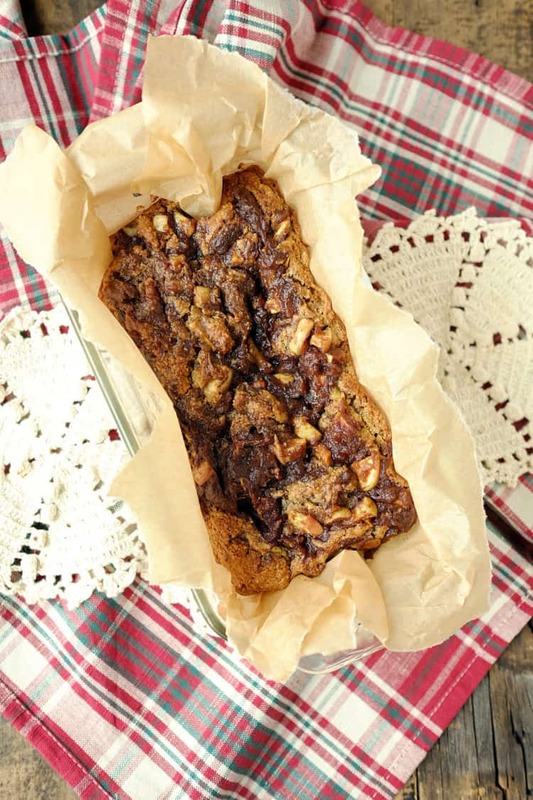 Savor each delectable bite, and let us know how you like our decadent cinnamon apple streusel bread by leaving a comment below. Also, take a picture and tag it on Instagram @realsimplegood so we can check it out! Preheat your oven to 325 degrees fahrenheit, and line a bread pan with parchment paper. (Note: We used a glass bread pan). In small mixing bowl, use a whisk to combine the almond flour, tapioca flour, baking soda, and salt. In a large mixing bowl, whisk your eggs. Add your nut milk and maple syrup to the bowl and whisk until everything is combined. Slowly add the dry ingredients to your bowl with the wet ingredients. Whisk until a batter forms. It will be a little thicker than a muffin batter. Pour the batter into your parchment lined bread pan, spread evenly in the pan, and set it aside. To make the streusel topping, place your dates and water in a microwave safe bowl, and heat in the microwave for 45 seconds to a minute. Remove from the microwave and use a fork to break down the dates until it turns into a paste. Add the rest of your streusel ingredients to the bowl and continue stirring until everything is thoroughly combined. It will be fragrant and enticing. Pour the streusel topping on top of the batter in your bread pan. I poured it down the center, going length wise so there was a strip of streusel from end to end of the pan. Use a spoon to swirl the streusel into the batter. Place in the oven and bake for about 50 minutes (ovens may vary a bit...ours is really old). Check at 45 minutes. You'll want to bake it until the edges start to brown. The streusel topping will remain a little gooey. If you stick a toothpick in the center, you'll feel that the bread part is cooked below the streusel topping. Once the bread is finished baking, remove from the oven to cool. Once mostly cooled, pull the bread out of the pan using the parchment paper to hold onto. Slice and seve...it's so yummy while it's still warm. Enjoy with our peppermint mocha for the ultimate holiday experience! Store in an airtight container on the counter or fridge for 5-7 days.